Cause of, and answer to, all of life's problems. Yesterday, CBS revealed this six-minute trailer/first look of their upcoming fall show, Supergirl. Since then, on news and social media sites, there has been joy and trepidation. Regarding the latter reaction, I’ve seen quite a bit of worry about the romantic comedy set-up, comparing the trailer to The Devil Wears Prada and SNL’s recent Black Widow trailer. Certainly there are rom-com elements to the Supergirl trailer, and presumably, the show, but the true specter that haunts the Supergirl trailer is the failed Wonder Woman pilot from 2011. The leaked script pages and rough footage of the pilot were terrible on myriad levels and was the closest superhero adaptation to the SNL parody. There was actually a scene of Wonder Woman/Diana crying about her break-up with Steve Trevor while eating ice cream. We know how bad a female-led superhero show can actually be, but rom-com elements are not the root of these problems. It’s a symptom of a two-fold cause: the scarcity of female representation in superhero media that leads to an incredibly high burden of representation, and a general loss of uniqueness attached to superhero characters or worlds. The two issues coincide most clearly in the House of El. We cannot avoid that Supergirl is derivative of Superman. She was introduced 20 years after Action Comics #1 introduced Superman to the world, and she is Kal-El/Clark/Superman’s cousin in almost every iteration. Her origin is tied to his (in some versions, she’s meant to be his babysitter), her outfit mirrors his, and her tone is usually as hopeful as his. The first look of Supergirl even begins with Kal-El’s story and ends with his approval-via-cape. Yes, it’s sexist and paternalistic, but it rings true for the character, her history, and her relationships. She is inspired by her cousin, loves him, and values his esteem, but she also chooses to be a superhero without even asking his opinion. This is all to say that Supergirl shares a lot of characteristics and tone with Superman, and the romance is part of that. 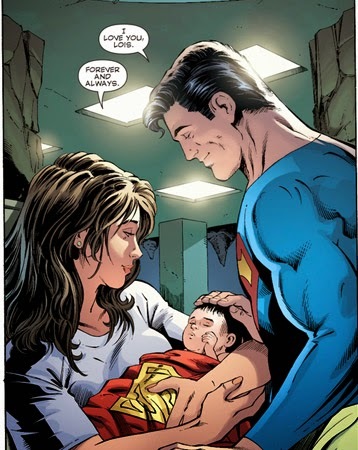 Although the New 52 run of these characters moved far away from the core Super-characteristic of love, Superman and his many iterations are mostly romances. Yes, there are massive battles and alien threats and all manner of derring-do, but the heart of Superman is Lois Lane. She has been around as long as Superman and has been his primary love interest for all of that time; in fact, every modern adaptation of Superman has devoted considerable time to the relationship between Clark/Superman and Lois. Almost every first meeting is essentially a rom-com meet-cute twice over: bumbling new guy Clark meets confident, talented Lois and falls for her, and facing-death Lois meets high-flying Superman and falls for him. But because it’s a male superhero story, these movies and TV shows are generally not categorized as romances or romantic comedies. Except for one notable adaptation that was a romantic action-adventure series: Lois and Clark: The New Adventures of Superman (ABC 1993-1997). Lois and Clark was created by Debrah Joy-Levine to be a story about Lois Lane, but as it progressed, it also happened to become, in my opinion, the Superman adaptation that had the best understanding of Superman’s story and what makes Superman a unique superhero, both of which revolve around relationships with humans, particularly his love of his parents and Lois. When Superman is accused of having a god complex in an episode in which he is put on trial, he replies, “I really do believe that we’re all put here on this earth, or whatever planet we’re put on, to do better than we think we can. To be kind, helpful, generous, and forgiving.” It’s corny, earnest, and infused with hope. And, like almost every moment in Lois and Clark that exemplifies who and what Superman is, it is said because of Lois and his relationship with her. Superman does not exist without Lois Lane. Literally, she names the hero, and figuratively, she is the one who gives him the strength to do what he does while in the cape. 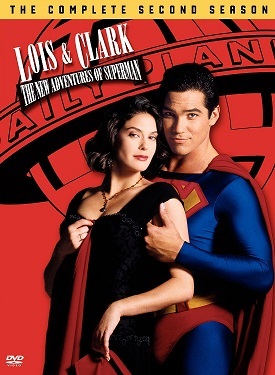 Even on Smallville (WB/CW 2001-2011), the entire final season revolves around Lois and Clark’s relationship and how she is the reason he finally makes it to both tights and flights. And in many Supergirl stories, love is just as much a goal for Kara Zor-El as it is for her cousin. She develops crushes, goes on dates, and finds her grounding with her family. Superman and Supergirl are both aliens, orphans, sole survivors of an entire planet, and as such love–familial or romantic–is an important element to their sense of belonging on earth. That sense of belonging, of loving humans and humanity more generally, and trying to be the best version of themselves in relationship to other living things is the core of their morality and the check against their potential for tyranny. For all these reasons, I am not worried about romance being a part–even a big part–of Supergirl. But I am worried about the narrative of Supergirl being a rom-com. Where Superman has as many iterations as factions of fans, Supergirl struggles to even hold on to her own title in comics publishing, and few live-action versions. More than merely her own history, she will be the first live-action eponymous super woman of this current cycle of superhero media. She beat both Wonder Woman (2017) (who hasn’t had live-action iteration since Lynda Carter in the 1970s) and Captain Marvel (2018) to the scene, and as such she’ll face heightened scrutiny and–being on CBS and going agains Gotham in the fall–a higher barrier to success. She carries the burden of representing female superheroes on her shoulders alone, but that I hate to think that means that any romance diminishes any female superhero. Supergirl–optimistic, loved and loving, hopeful and inspirational, loves being a superhero–is not Black Widow–emotionally scarred, suspicious, guilt-ridden, badass spy. Where elements of romantic comedy work with one, they do not with another. This is the second part of the problem facing Supergirl. In shared universes and with more exposure in mainstream media adaptations, there are certain tropes that are repeated and certain unique characteristics that are sloughed off. It’s easy to use differences in accent, powers, costume, and general temperament as shorthand to differentiate among superheroes, but it takes many hours of exploring these characters to get to how the characters view and approach the world. There are over 20 hours of the Marvel Cinematic Universe, but we’re only getting hints at how these heroes view the world and their responsibility to it. In the DC cinematic universe being built, it’s even more apparent how differences are being erased as Superman became dark-and-gritty in Man of Steel and images of Wonder Woman, a warrior, yes, but for peace, place her in a muted wasteland. Instead of Batman providing the pragmatic, cynical accent to a group of heroes who embrace intrinsic goodness, the DC cinematic world is bleak, as if it’s the world as seen by Batman not a wider world featuring Batman. The CW’s Arrow as well started out as basically a Batman story; gone was Ollie’s notorious liberalism. But Arrow has led to the one superhero adaptation that understand that different heroes require different worldviews: The Flash. In last week’s episode, The Flash tried to handle a situation like he thought The Arrow would and failed utterly, only to be reassured that his unique compassion and ability to see the best in people are what make him a hero. Supergirl doesn’t have an in-universe superhero to compare herself to other than Superman, but the acknowledgment of difference, that not all superheroes are alike–especially since The Flash and Supergirl are produced by the same people–makes me hopeful. Supergirl is not Black Widow, but she is like Superman, and neither of those things is a bad think or something to ignore. Now we just need to get her some super (best) friends (forever).